Although our previous days enquires had suggested the village of Vattavada was safe, we still wanted to pass through as early as possible to avoid any potential problems. We woke at sunrise, checked on Bob (he had moved, but was still in his permitted area), packed and headed out early. Within 20 minutes we had passed through Vattavada with no issues, we were even waved at and greeted with enthusiasm by the few people out and about. Because of our underlying fear that it might not be safe for us here we didn’t stop to take on extra food or find breakfast… this was a mistake! 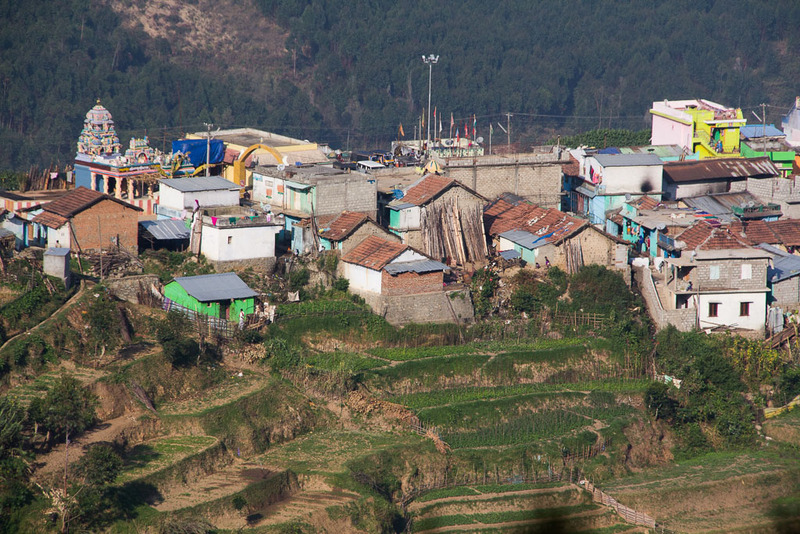 It was at this village that the steep old road heads up into the hills so some careful navigation was required to ensure we found the right trail. 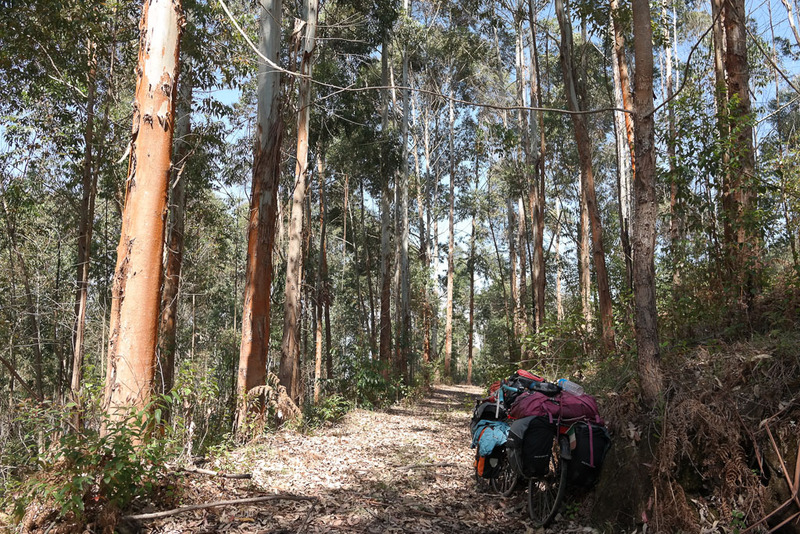 The gravel forest track was steep straight away and it wasn’t long before we were pushing our bikes uphill, fortunately the tall trees shaded us from the increasingly strong sun. We hadn’t passed any signs or warnings that we were approaching a national park which would help in our pleading innocence if we were to be caught. 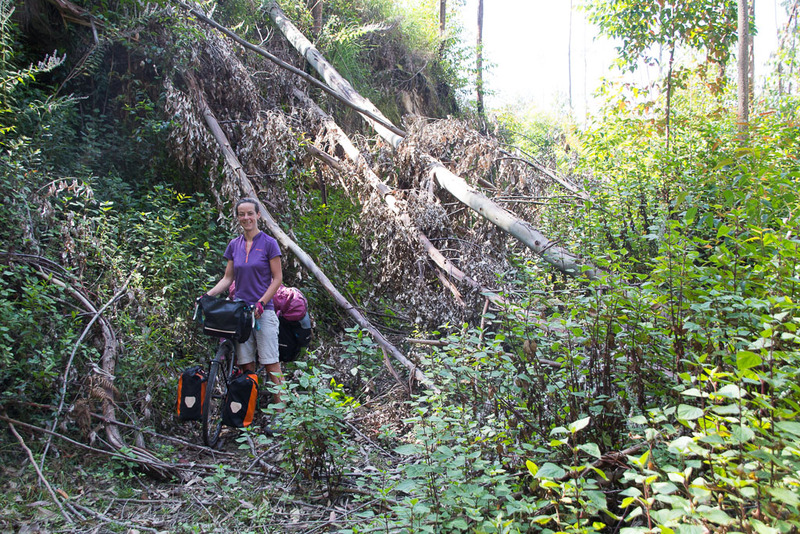 As we approached the park boundary as outlined on our map we left the bikes against a tree and checked each bend to make sure we were not going to run into a hidden forestry checkpoint or national park office. It turned out there was nothing around at all. 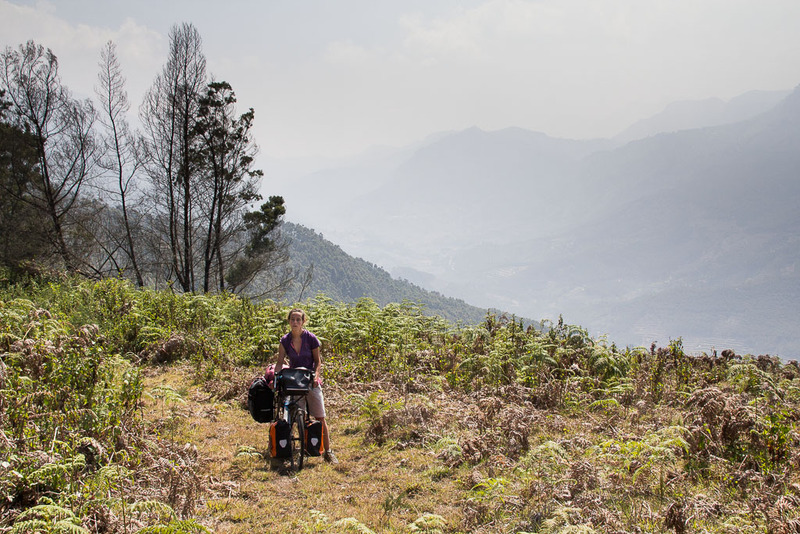 We had passed two farmers near the bottom of the hill who asked if we were going to Kodaikanal, they were impressed that we were going to try to cross with our bikes and wished us luck on our journey, at the same time confirming that we were on the right track. After a few hours of effort we could hear a jeep coming up the track behind us, clearly it was struggling as we continued to hear it for at least thirty minutes and certain sections were causing problems that seemed to delay them for some time. We were unsure what to do – we had not quite crossed the point where our map suggested the NP began, but we had put a considerable amount of effort in reaching where we were. We didn’t want to be turned around so at the point when the jeep was on the hairpin bend below us we pulled our bikes into the bushes and hid… for some reason we didn’t hear it come any closer and think they must have reached a point they were unable to continue on, after waiting ten minutes or so we continued and were undisturbed again for the rest of the day. We should have stuck to building railways! 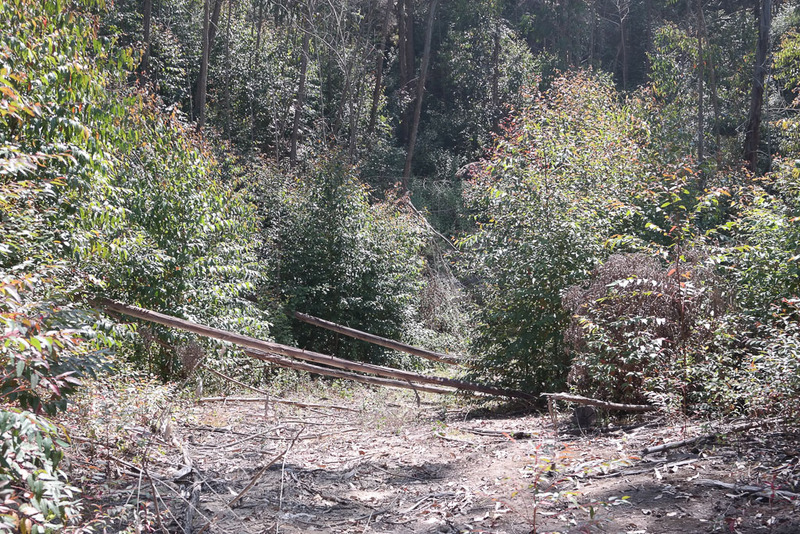 Clearly this had once been a good road sized trail up and over the mountain, but heavy erosion, landslips and vegetation growth had turned it into a really tough route. We knew this section should only be 9km, but we had about ~500 meters of vertical ascent (not including all the up and down) to climb before the gradient was supposed to improve and level out, so the going was exceptionally tough. 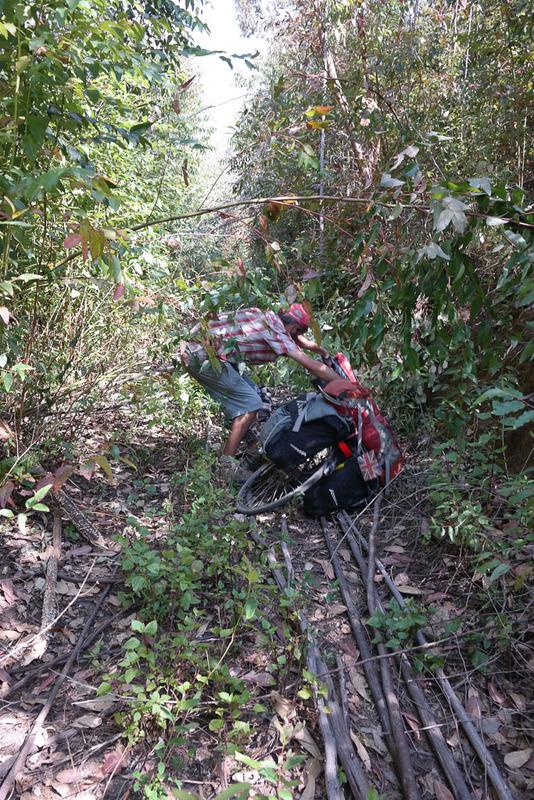 The steep slope and constant obstacles meant that not only were we pushing, but we regularly had to lift our bikes over fallen trees or over large rocks. We came to a junction where we made a costly error, mistakenly taking a wrong turn that resulted in at least a days extra effort that almost resulted in us turning back… doh. Great spot for a cycle! The old under, over, under obstacle! Going left at the junction instead of right meant we followed an even older path that was in an absolute terrible state. 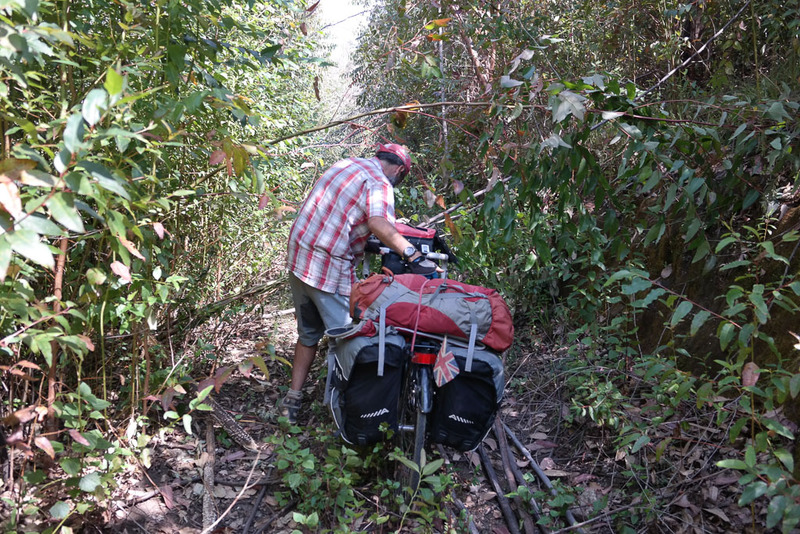 Vegetation had almost completely taken over as we followed what was at best a single track trail in through the thick saplings and dense undergrowth. 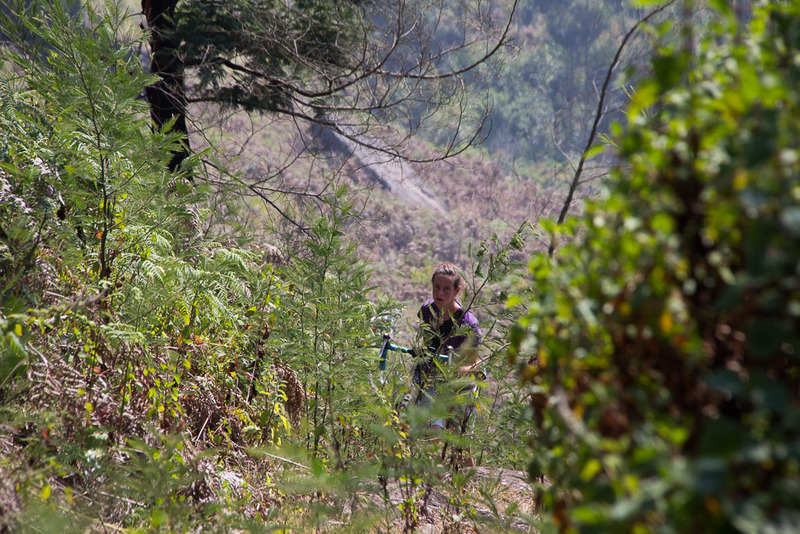 Almost every 20 meters we were lifting our bikes over obstacles while constantly pushing up the steep gradient. 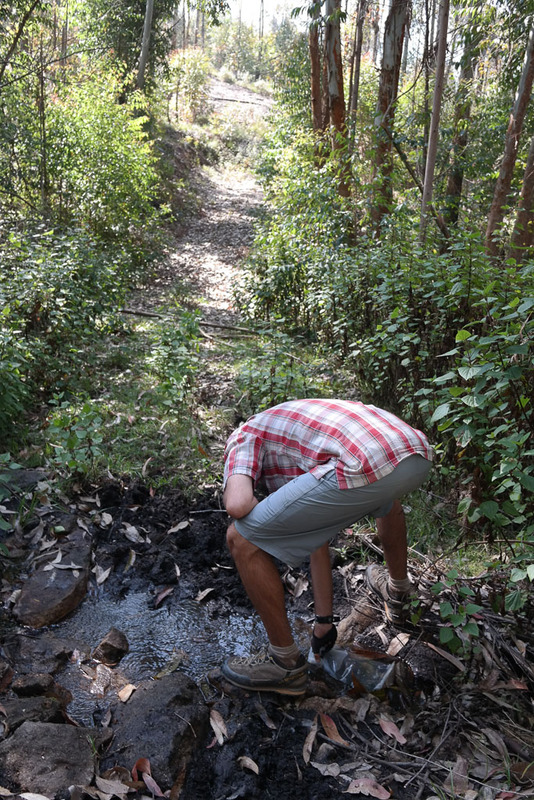 By now it was exceptionally hot and we were low on water, finding a small muddy stream we filtered another four litres before continuing. 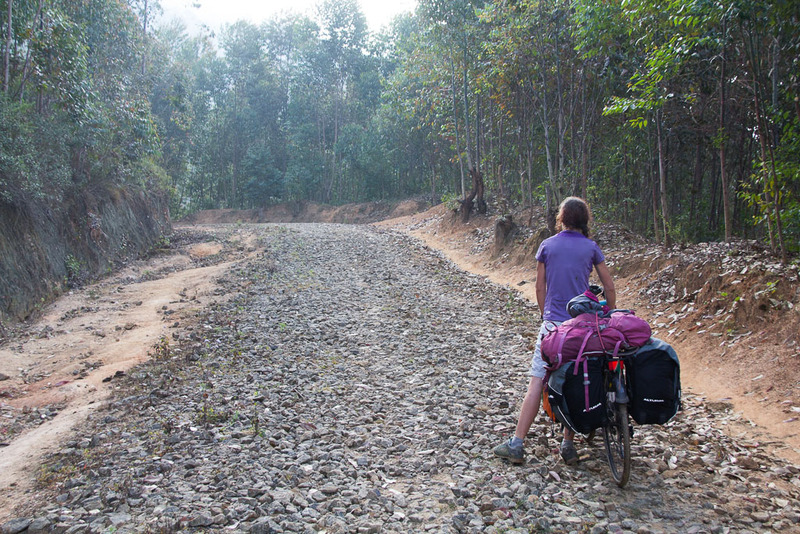 The road less travelled…. turns out to be not so good! 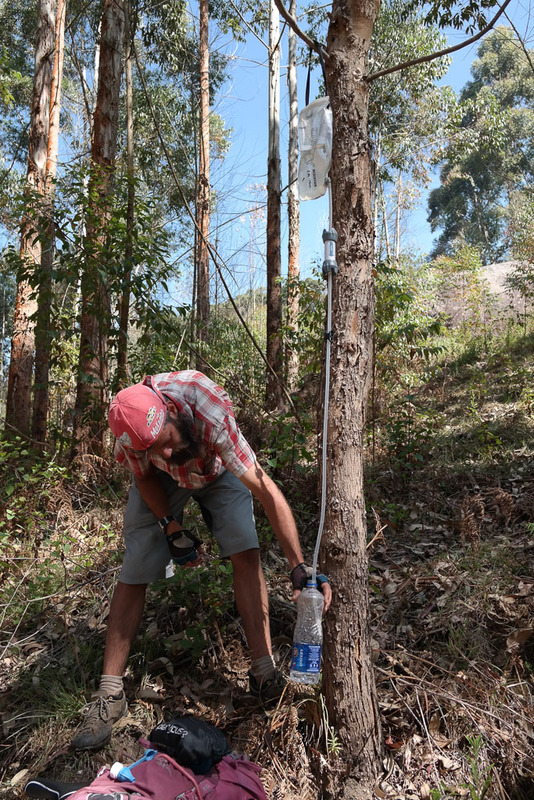 Our platypus gravity filter… an amazing bit of gear! Reaching the edge of the forest we were offered our first views of the valley below us and an indication of how high we had ascended! It was 12 O’clock now and we had been pushing our bikes for over five hours, we were absolutely exhausted. 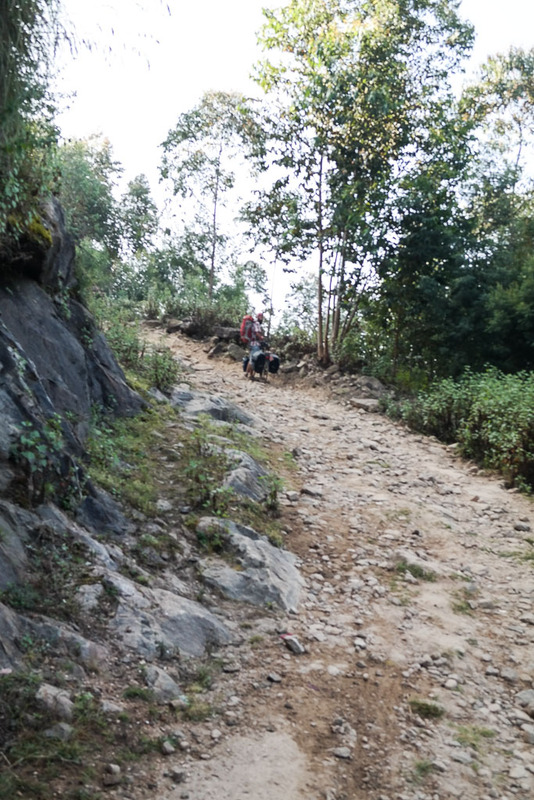 The trail in front of us had huge meter deep gullies from heavy rain and was almost impossible to push along. 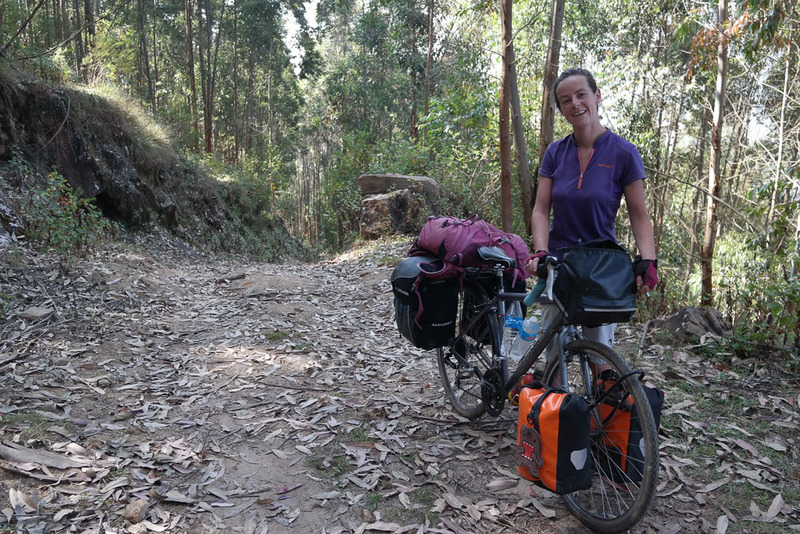 By this point we had to unload our bikes and load carry our equipment in 100 meter sections to pass the ground (funnily enough we didn’t take any photos… it was just too hard). 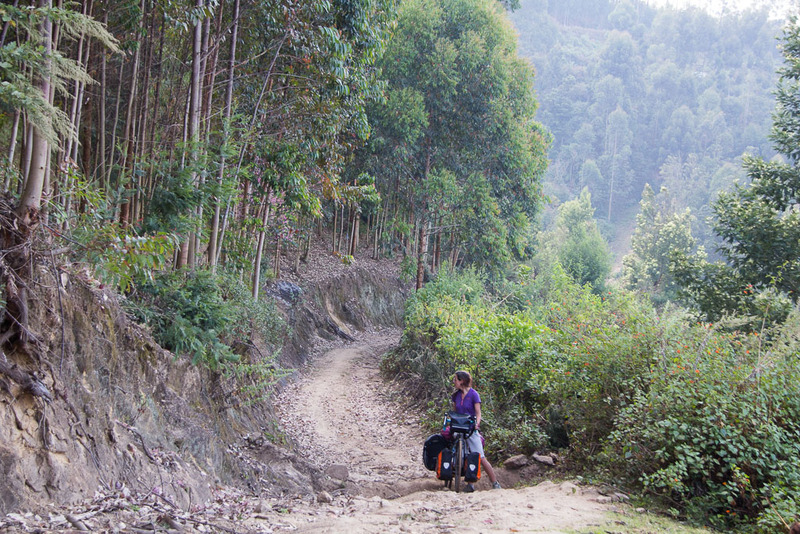 We couldn’t even push our unloaded bikes, the ground was so uneven and steep we had to carry them together. I can’t even comprehend quite how hard this was, the bags are not designed to be carried so are uncomfortable to walk with, the ground was tough and the heat was almost unbearable. 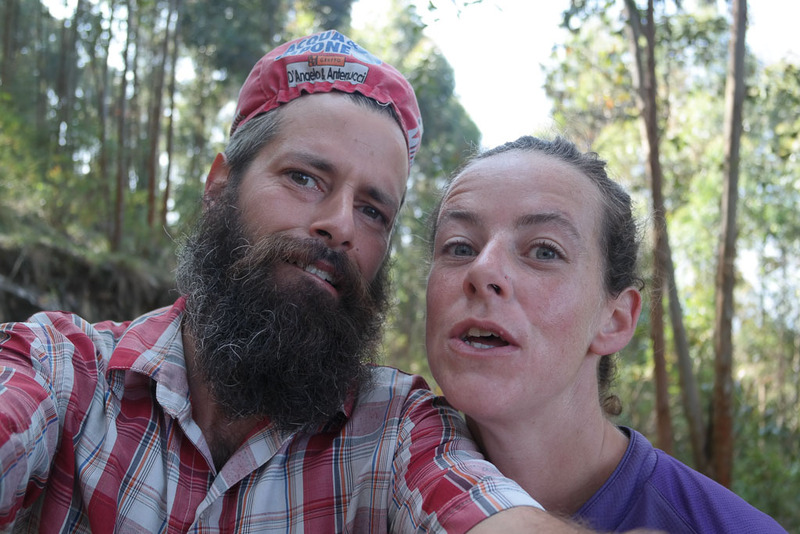 We hadn’t eaten anything and despite drinking all the water we had filtered we were both starting to suffer from dehydration. 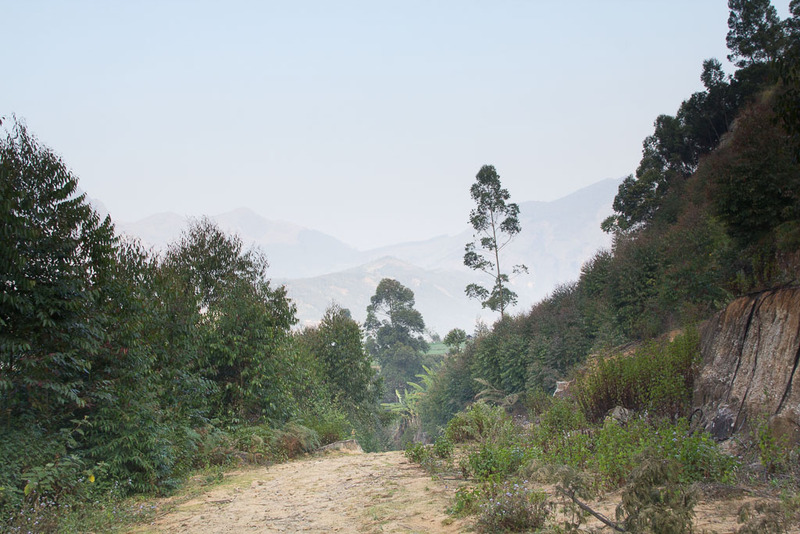 We reached a small plateau where the path just seemed to disappear, thick forest had completely taken over where the map suggested it was. Leaving the bikes where they were I investigated but just couldn’t find the route the former road had taken – it seemed to be a complete dead end. The terrain on one side dropped off back down into the valley, and on the other it was far too steep, rocky craggy slopes up to the mountain top. We had only travelled 6km or so but were seriously exhausted, by far the most physically drained we have been on our trip so far – not knowing where we had to go, not knowing where the next water was available and having very little strength to continue we decided to pitch up in this idyllic spot and decide what our options were. In order to camp we had to find water, but the only place we knew we could get some was 1.5km back the way down hill where we had come from. 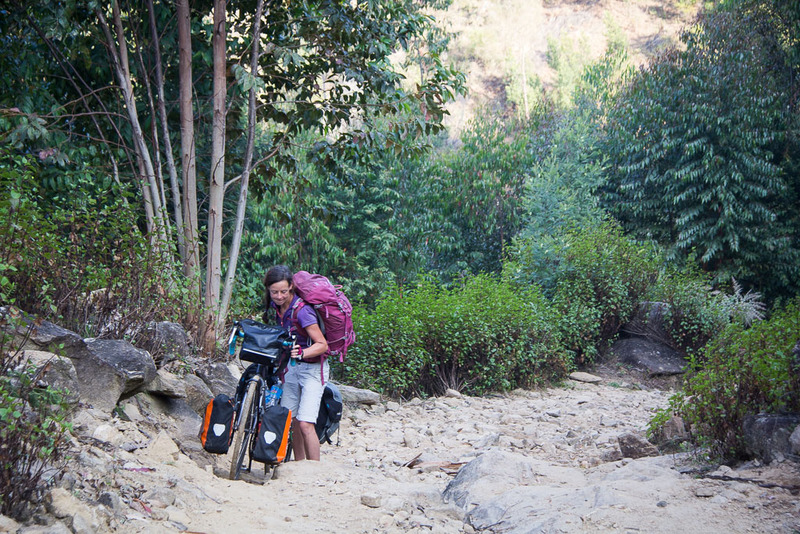 Sheena emptied one of our rucksacks, loaded it up with empty bottles and set off to fill them. 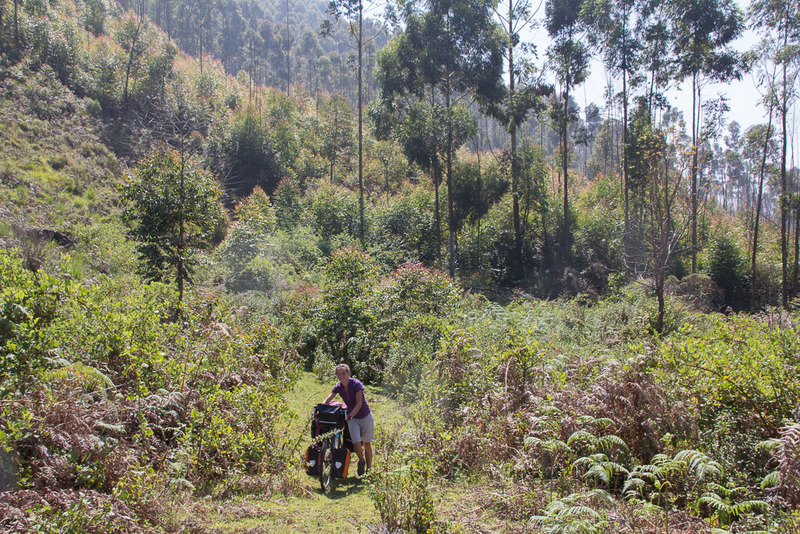 I continued to carry the gear in loads up hill to the suitable flat area that was only about 200 meters away, but required eight trips – when I was done I walked down to meet Sheena and help her carry the 10 kilos of water! 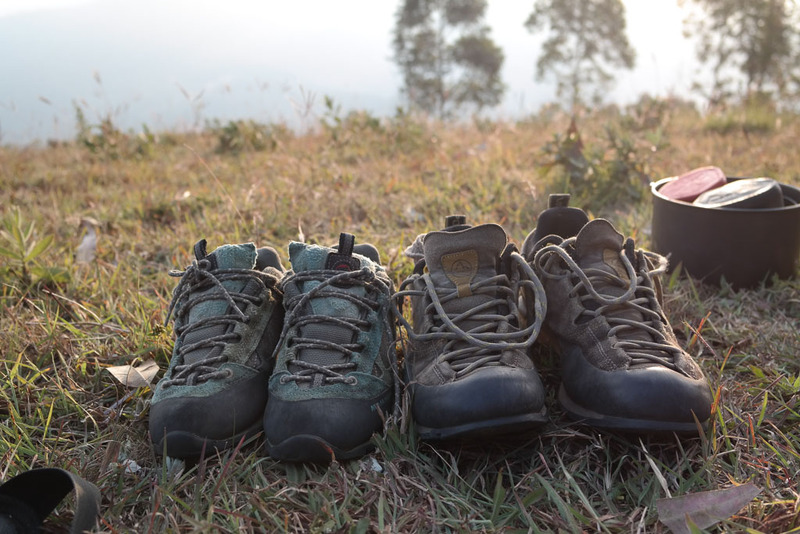 Both of us really struggled and by the time we were back with our gear we almost collapsed. We found shade under a tree and started to purify the water, both of us with banging headaches were despite for liquid. We added some rehydration salts, stripped off some clothes and practically passed out on the ground. It was only 2.30 and we were spent. 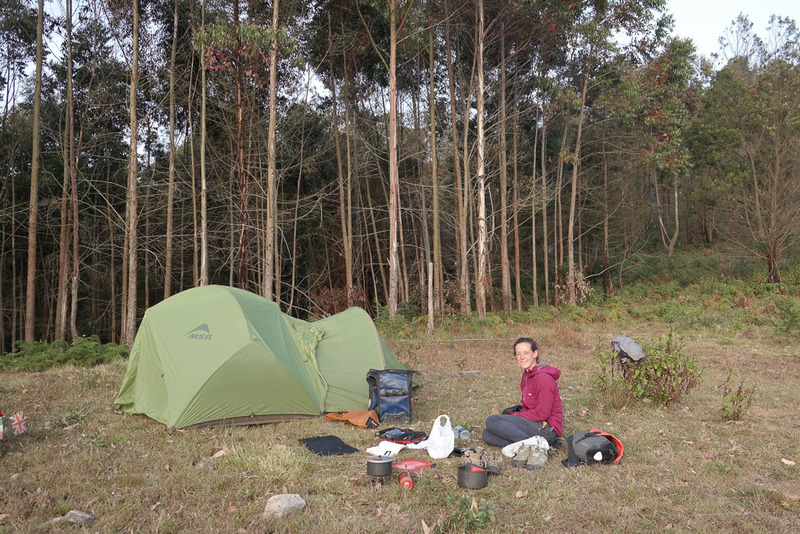 When the heat had dropped slightly we began to set up camp, almost immediately I started to cook and realised that we had forgotten to stock up on fuel before we left! We had half a bottle which is a fair amount, but had bought a bag of lentils to make daal for our dinners which is quite fuel intensive. Now we had the additional worry that our fuel may run out! 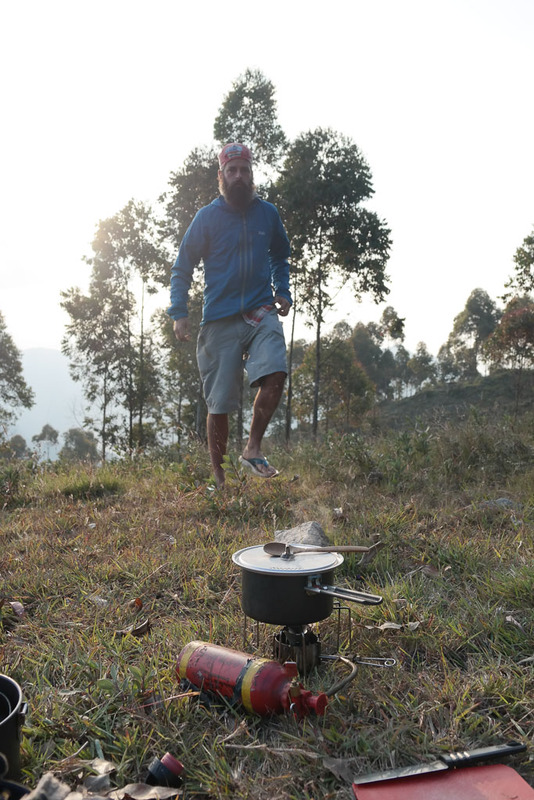 With our food cooking we started to consider our situation and what we could do, we had two options; one was to try and find the route the other was to go back the way we had come. 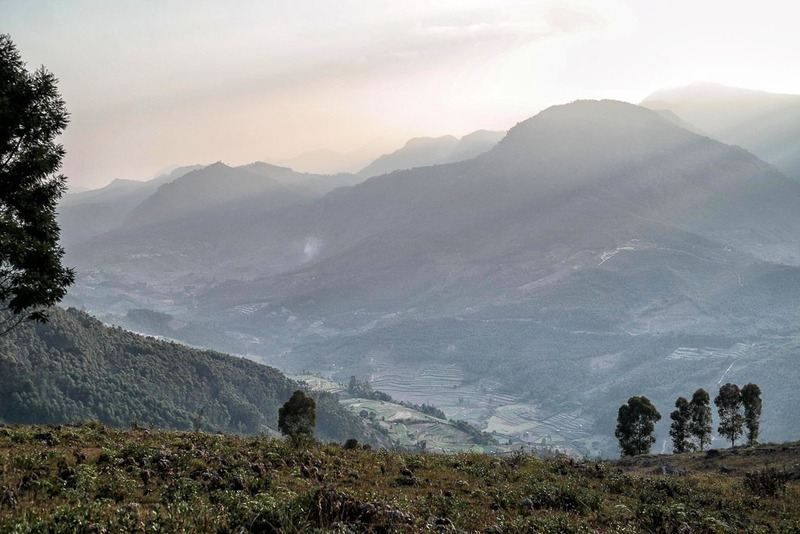 Going back the way we had come would be exceptionally difficult all over again and would send us with no other option but to go back to Munnar, although hard because of the sacrificed physical and physiological effort it would be safer. Continuing presented a set of uncertainties, especially as we had lost the route. 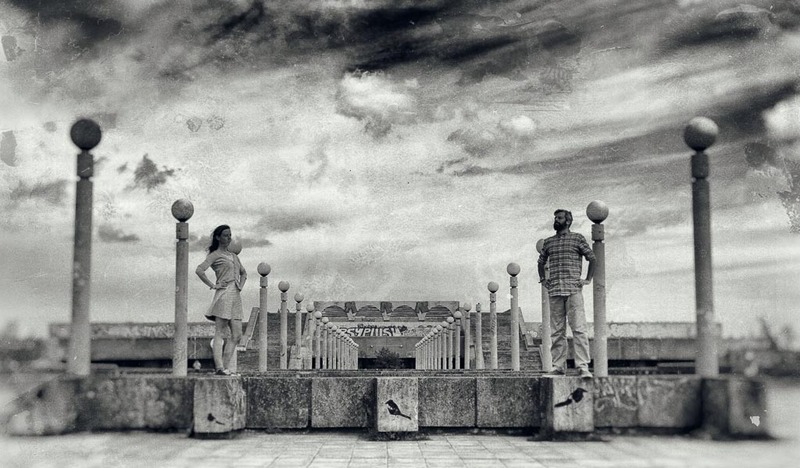 We pondered over our maps, fired up our computer with saved Google earth images and tried to find out if we had gone wrong, or if we had just reached an especially hard part of the journey. Eventually we did find the junction we had made an error but realised that going back down to it was not going to be possible, retreating to the junction meant descending almost half our ascent and the toughest part of it. Studying the maps we reaslised that the part of the route labeled the ‘ridge road’ was above us at the top of the hill, the old road that we were following doubled back on itself and joined it a few kilometers away. We decided that after a good feed, a good nights sleep and lots of liquid we would get up early, pack our rucksacks and hike to try and find the trail above us to follow it and find the route we were supposed to be on – correcting our error and being on our merry way! Our daal lacked the little extras that makes it a proper meal, but the quantity cooked left us feeling full. 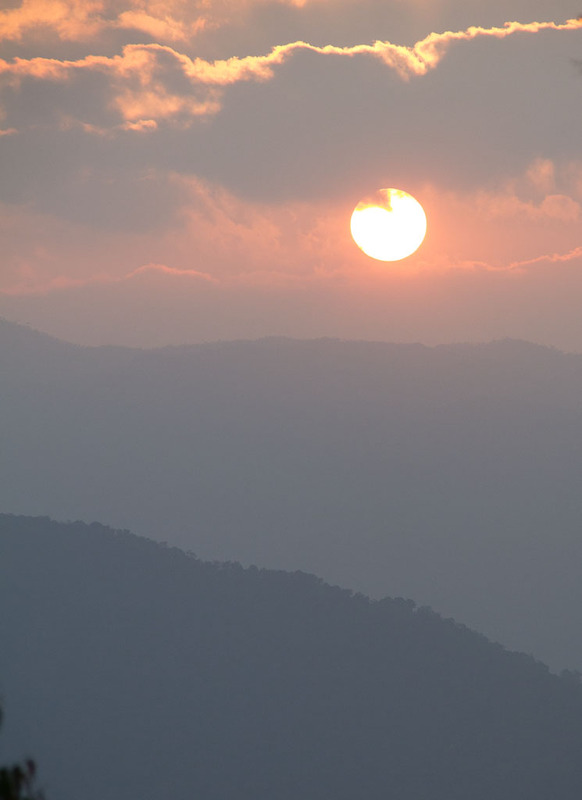 We snacked on biscuits while watching a beautiful sunset over the valley below us, as soon as the sun dropped below the horizon we retreated into our tent and read to pass the time. 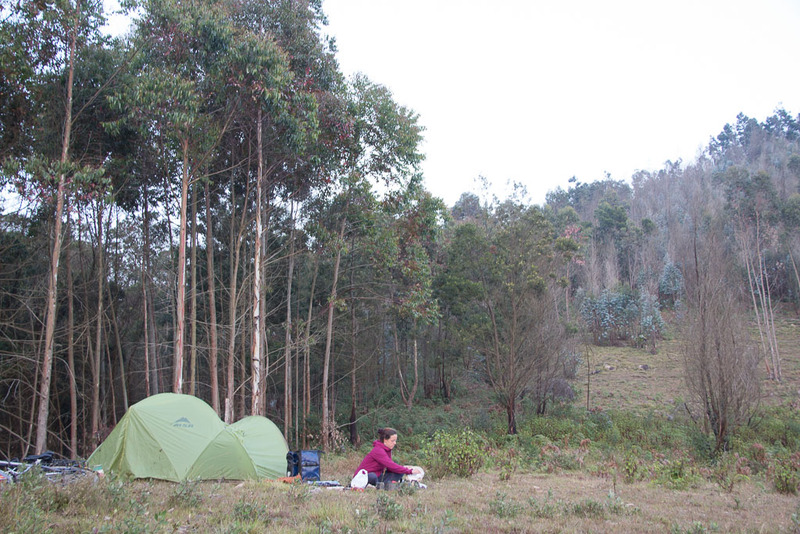 When camping in the wilderness the night is long, it is hard to suppress the desires to sleep as soon as the sun goes down… but 6.30pm was far too early! The smell of these should have kept the animals away?! At about 8.17pm while truly engrossed in our tattered 30 rupee salvaged paperbacks I heard the striking sound of a single twig breaking. Aware that we were not supposed to be where we were I motioned to Sheena for her to turn her torch off and be quiet – there was silence for a while until there was another distinct sound of a single small twig breaking – it sounded like someone was trying to move quietly in the woods near our tent. Concerned that someone was creeping up upon us, but with a quick whispered conversation racing between small deer or large elephant I opened our small knife, took our torch and jumped out for a look. With the tent in between myself and the tree line I shined the torch nervously in the direction the sounds had come from, when the combination of a rapidly increasing heart rate and huge surge of adrenaline left me pretty much physically shaking as I saw the last thing I would ever have expected… the faint stripes of a tiger standing side on with its glowing eyes looking at us….. bloody hell, they are supposed to be shy and avoid humans! Arghhh… what the hell are we going to do?! It was in the green patch in the trees behind Sheena. “What is it?” whispered Sheena…. Writing this out now I didn’t really choose my words well, “I don’t think I want to tell you what it is, can you pass me the pots and pans very quickly, very quickly… I don’t think you want to know what it is, errr but sorry, it’s a (some rude words) tiger” at which point Sheena clearly wanted to know what it is and just said what is it, what is it a few times while the demands for the cooking pots were intensified with more expletives and became more desperate. It wasn’t possible to keep watching it while banging the pans onto the bikes and manically hitting various metal things to find something that made the most noise, at the same time shouting as much as possible to make it clear we were people and not food. Sheena leapt out and joined me as we made a racket worthy of any New York pot bashing street performer accompanied by two drunk town criers. Mind racing we tried to think of any possible ways to keep an animal away, fire was the next logical step but with an absence of wood near us (we had no intention of going anywhere near the tree line as that was towards the tiger…) I could only grab a few of our empty water bottles and pour petrol over them offering some protection for all over 45 seconds and ruining our ability to see further than ten meters around us! Scanning the tree line with our lights we couldn’t see it any more, we hadn’t heard it disappear so clearly we were worried it was still there somewhere – it has just slinked off silently into the forest. We continued to make as much noise as possible for at least ten minutes while continuing to scan the trees using our lights. The eyes of cats reflect light with great efficiency so if it was walking about we would have seen it, partly confident it was no longer there we slipped back into the tent while trying to reassure ourselves we were safe… it had been upslope, upwind and we had been silently lying down – it was probably just walking past and we had been exceptionally lucky/unlucky in coming into close proximity with one of India’s rarest animals (although they are concentrated into limited areas, this area acted as a land bridge between two large national parks). It took a while to manage to sleep, it was hard not to image the tent was going to collapse under 100 odd kilos of angry feline. The green patch above her head! Still in good spirits despite the hard work! Amazing! 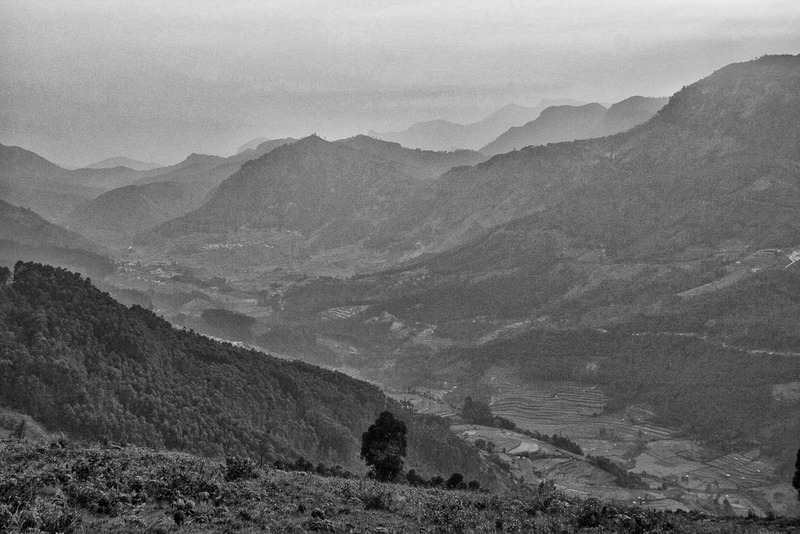 I love cycling, and just came from Munnar (not by bicycle). Good luck with your journey! A lot of people think that the chances of meeting tiger is really rare. However, rare does mean NO. Accident is always happen when we think it should not happen, but it happens without your expectation, that is accident come in. Country like Malaysia, has tiger. Ever thought that it is very rare news reported that people be attacked, however, on and off, people still report to see a tiger here and there by car. However, what if a bike tourer meet it ? Try to Google what to do with it if meeting, so far, none of idea is workable. To dead or live, just depend on fate, if meeting s tiger during bike touring.